Whether you view it as a riff on “Hamlet” (though the show’s got that weird ick factor of the nefarious uncle pawing at his nephew’s girlfriend as his future wife, instead of his sister-in-law, as in the source material) or a prime example of Social Darwinism (assume your legacy, your rightful position in the food chain; stay in your class, your caste, and don’t muck with the hierarchical system; the outcasts should always remain outcasts, etc. ), Disney’s “The Lion King,” as animated musical film (1994) or stage musical (1997) is an epic eyeful. The theatrical production, winner of six Tony Awards, is also the third longest-running musical in Broadway history, and Broadway’s top-grossing musical of all time. With more than 6,700 performances under its furry belt, it’s still running — after 19 years. The North American tour has been seen by more than 17 million theatergoers and grossed over $1.2 billion. Worldwide, the show has been seen by more than 85 million people, for whom it’s been translated into eight different languages. Now, for the third time, the national touring production has brought Pride Rock to San Diego, for an extended run (well, by Civic Theatre standards, anyway: nearly a month). Having seen the original Broadway production, and the first visit of the show to the Civic, I had forgotten just how mind-blowing the creative elements are. Director Julie Taymor, who also designed the stupendous costumes and co-designed (with Michael Curry) the amazing masks and the 200+ puppets, has the wildest imagination in the business. The Civic Theatre has been re-configured with two additional aisles, so the electrifying opening parade of animals, including a huge, spectacular elephant puppet (manned by four performers) can sashay down to the stage, singing, and bringing us all into the “Circle of Life.” All through the performance, however, I couldn’t help thinking of the “Forbidden Broadway” spoof of the show, which twists the lyrics of the well-known Elton John/Tim Rice song, “Can You Feel the Love Tonight?” into “Can You Feel the Pain Tonight?” Some of those inventive costumes put the actor/dancer in tortuous, back-or-neck-breaking positions. The tour, I understand, travels with a bevy of chiropractors. Richard Hudson’s dazzling sets, and the animal stampede, have been scaled down for the tour, but they and the lighting (designed by Donald Holder) remain breathtaking The singing of the 49-member cast is strong throughout, and the dancing is excellent (choreography by Garth Fagan), though there are a few too many repetitive dance interludes. Much of the score has become quite familiar (”Hakuna Matata,” anyone? ), but some of the most interesting numbers are the African ones, co-created by South African composer Lebo M. The impressive, 18-piece orchestra (conducted by Jamie Schmidt) includes six local musicians. Alas, the Civic Theatre always makes it hard to discern lyrics in group songs. One of my primary reasons for returning to this musical spectacle was the appearance of a local-boy-made-good, who by now has performed all over the country, including at The Old Globe. 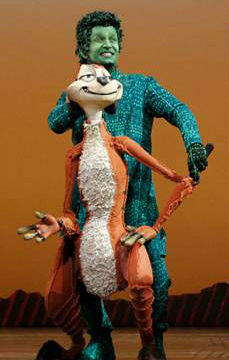 Nick Cordileone is terrific as the wisecracking meerkat, Timon. Very funny moves and speech patterns and all-green appearance (though the 15-pound ‘kat himself is orange). He’s a perfect counterpart to the comical Pumbaa of Ben Lipitz, who’s performed the role of the smelly warthog over 5,000 times. 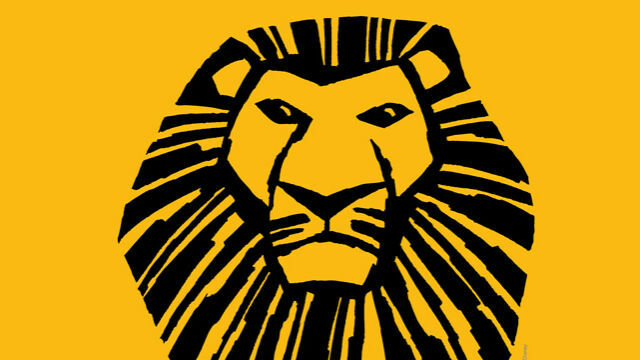 Gerald Ramsey makes for a regal Mufasa, king of the Pridelands, a brave and wise force for good who wants to pass his acumen and his crown to his young son, Simba (Aaron Nelson in Simba’s adult incarnation). Wonderful character creations by Buyi Zama as the mystical mandrill, Rafiki (who thrillingly speaks in a click-language at the outset, one of four African dialects spoken in the show) and Drew Hirshfield as the king’s avian majordomo, Zazu. Mark Campbell is aptly mustache-twirling as the evil leonine uncle, Scar. There are some long stretches, but the eye-candy just keeps coming — and keeps kids of all ages wide-eyed and engaged. The (adult and child) screams that accompanied the rapturous opening night standing ovation said it all. Performances are Tuesday and Wednesday at 7 p.m., Thursday-Saturday at 7:30 p.m., Sunday at 6:30 p.m. Matinees are Saturday at 2 p.m. and Sunday at 1 p.m. Additional matinee performance on Thursday, Sept. 29.